Bedford, NH – Land For Good trained southern NH real estate professionals on working with farms with commercial agricultural potential. To improve the conditions under which many aspiring, beginning and established farmers seek land, Land For Good (LFG) has developed and is conducting a training course for real estate professionals. Called “Tools and Resources for Working with Farms with Commercial Agricultural Potential,” the three-hour, continuing education-approved course is designed to improve the ability of real estate professionals to connect with commercial farm buyers. The training was piloted in Vermont early last year, and replicated twice in NH this year. 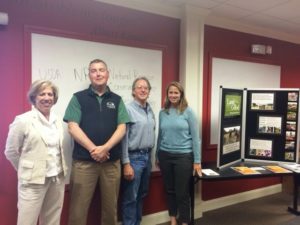 Sharing their expertise, our presenters (left to right) Elizabeth Boepple, BCM Environmental Law; Chris Wells, Piscataquog Land Trust; Mike Ghia, LFG Vermont Field Agent; Cara Cargill, LFG New Hampshire Field Agent. Many beginning and aspiring farmers turn first to MLS (multiple listing services) when embarking on a farm property search, and often end up frustrated and discouraged. Many real estate professionals in New England have a sincere interest in seeing working farms stay in production, though few are conversant about how to market farms or farmland with commercial potential. The training aims to better connect real estate professionals and prospective buyers of farm properties with commercial agriculture potential. LFG designed the course with help from our friends at UVM Center for Sustainable Agriculture and Vermont Land Trust. 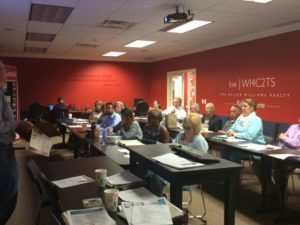 Training has so far been approved by the Vermont and New Hampshire Real Estate Commissions for continuing education credits. Through the training real estate professionals learn how to identify characteristics of the commercial farm buyer and the characteristics of farm properties that are important to them. They are introduced to the legal and tax issues specifically relevant to farms, as well as introduced to the range of farm financing options. Conservation easements – including considerations when selling farms with existing conservation easements – are also addressed in the course. The program has been well received by the nearly 100 real estate professionals who have taken the course so far. The biggest challenge for real estate professionals working with commercial farm properties is total knowledge of this property – and what brings value as an existing farm,” said one agent. Watch for more training sessions across the region. Contact us to learn more or to partner on a training session in your area. Email us at info[at]landforgood.org. This course was developed and delivered with support from The John Merck Fund, The Thomas W. Haas Fund of the New Hampshire Charitable Foundation, and generous Land For Good donors.